Eastern Shore Baptist Church has an exciting Eastern schedule. These events are specifically crafted to help you and your family grow closer to Christ, understand His sacrificial death on the cross, and increase the bonds of fellowship. Please take a few minutes and read over all the events. The Voyager’s Ministry at Eastern Shore Baptist Church invites children in grades 4th-6th to come to the Children’s Ministry building for an exciting event crafted to help us understand what Jesus did the days leading up to His death and resurrection. This is a creative way to tell the story of Christ’s sacrifice. It also helps implant the narrative of the cross in our children’s hearts so that they will not forget it. This is a fun event that you will certainly not want to miss. Voyager’s Ministry Easter Egg Hunt April 6th at 2-4 p.m. The Voyager’s Ministry of Eastern Shore Baptist Church invites you to the Al Trione Sports Complex Football Field on April 15th from 2-4 p.m. for an exciting Easter Egg Hunt. The Hunt is for grades Pre-School to 6th grade. We will have games, food, and tons of fun. Bring your family and friends. For the first time ever, Eastern Shore Baptist Church is hosting a Maundy Thursday Luncheon. 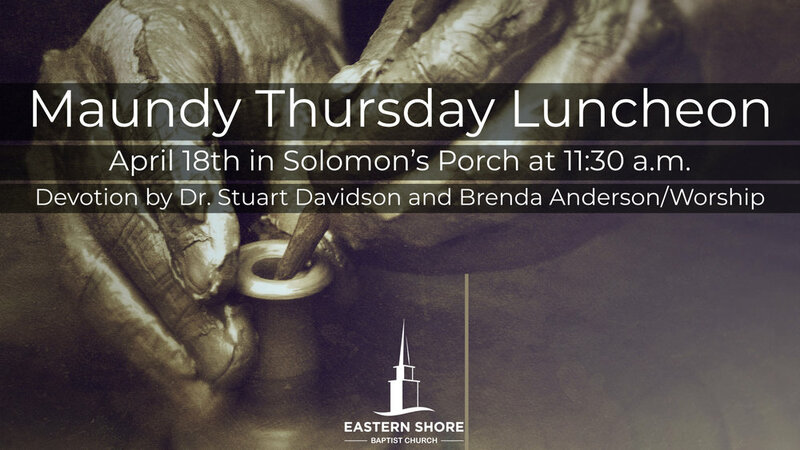 Join us for a great lunch (donations are welcome) and a great devotion provided by Dr. Stuart Davidson. Mrs. Brenda Anderson will also deliver a powerful devotional demonstration from the Potter’s Wheel. There will be a great time of praise and worship as well. This luncheon will only be an hour so you can return to work easily. Come and prepare your heart and mind for the Communion service later that afternoon. Maundy Thursday Communion Service April 18th at 6 p.m.
Come and join us for a time of worship and remembrance on April 15th at 6 p.m. in the sanctuary at Eastern Shore Baptist Church. There will be a time of worship and a time to share in the elements of the Easter season. This is a special time and is open to all who confess Christ as Savior. Come and prepare your hearts for the resurrection. Easter Service Sunday Morning April 21st at 10:10 a.m.
Our Easter theme is “God Will Make A Way”. Come Sunday morning for a powerful time of praise and worship as we celebrate the Risen Savior. Sunday morning will start at 10:10 a.m. and will feature our Adult Choir along with engaging solos. You will here an encouraging message from our pastor, Dr. Stuart Davidson. Invite your friends and family to the best worship service of the year.